There is a great deal of innovation in the use of wood in construction, from impressive modern buildings to new construction products that reduce build times and improve building performance. As a renewable resource with proven low embodied energy, wood is both an environmentally responsible and a highly practical choice as a construction material. However, forest management practices vary throughout the world: some are highly effective in delivering a sustainable, long term supply of timber; whereas others are less so, and could result in forest depletion and significant environmental degradation. Against this background, a number of certification schemes have been developed that seek to ensure that all timber is harvested from sources that are at least legally-sourced, and at best, sustainably managed. Sustainable Use of Wood in Construction explains how and why wood may be grown sustainably, and how this versatile material can be specified and � most importantly - sourced, for use in the construction industry. It explains the modern regulatory framework within Europe that seeks to eliminate the use of illegally-harvested wood, and it shows how to ensure that everyone who sells or uses wood for construction is following the rules. 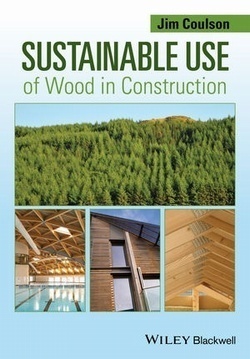 Finally, the book explains how, at the end of its first use in construction, wood can be recycled, by reprocessing into another wood-based construction material, or by using it as biomass. Jim Coulson FIMMM FFB is a Wood Scientist, Timber Technologist and a Fellow of the Institute of Materials, who has an encyclopaedic knowledge of the use of wood in construction, extending back over more than 35 years.